The Heat Is On campaign, image courtesy of the Colorado State Patrol. 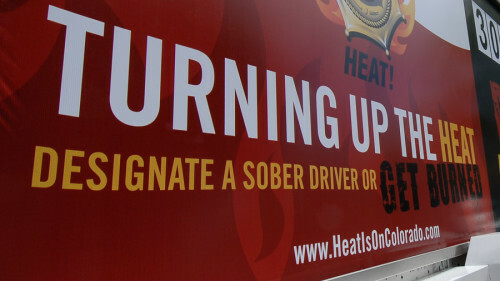 The Colorado Department of Transportation, the Colorado State Patrol, and local law enforcement agencies have teamed up for their Spring Events enforcement period, called “The Heat Is On.” Increased DUI began April 9 and runs through May 15. There are 70 law enforcement agencies involved in the effort. The increased enforcement is especially needed this time of year because alcohol and other substances that cause impairment are often consumed during graduations, spring break, outdoor festivals, and the start of baseball season. The spring enforcement period last year resulted in the arrests of 1,870 impaired drivers, and was the second year in a row that the numbers increased. About one-third of all deaths in vehicle accidents in the state are related to impaired driving. Darrell Lingk, director of CDOT’s Office of Transportation Safety, urges drivers to plan in advance for a sober ride home if they choose to drink at any spring events. “Never risk driving impaired,” he said. In Colorado, the legal limit for a DUI for blood alcohol content (BAC) is 0.08%; and the limit for Driving While Ability Impaired (DWAI) is 0.05%. Those found guilty can face jail time, fines, and/or a loss of their driver’s licenses. This enforcement period is one of 12 throughout the year when law officers focus their efforts to discourage impaired driving with sobriety checkpoints and saturation patrols, The Denver Post writes. There also will be DUI awareness posters in restrooms at Coors Field, where public service announcements featuring Rockies players will air on the Jumbotron before games, in both English and Spanish. In the PSAs, featured players will remind fans to “enjoy the game responsibly.” The bilingual announcements will explain the consequences of getting arrested for a DUI. According to CDOT’s “alcohol and impaired driving” page, more than 26,000 people are arrested for DUI in Colorado each year. Alcohol-related traffic accidents kill more than 150 people in the state annually. One problem is that many people in law enforcement’s target audience (young men between the ages of 21 and 35) don’t think having a few drinks would impair their driving. To reach these people, CDOT created its “A Few Can Still be Dangerous” campaign. If you drive impaired by drugs — even if they’re legal drugs like prescriptions and marijuana – you can be arrested for DUI.